Mad Professor stellt erstklassige Effektpedale für E-Gitarre und E-Bass her. Die Fertigung ist perfekt und der Klang absolute Spitze. Dass diese handgefertigten Pedale etwas mehr kosten, sollte deshalb nich verwundern. Die meisten Pedale gibt es in einer OFC (maschinell gelötet) oder in einer hand-wired Version. Dazu kommen Amps, Combos und Boxen der Extraklasse. Das ganze Sortiment ist immer bei uns testbereit. We made this one simple: one preamp tube, one power tube, one knob and one speaker, but up to 11 watts power that is enough even for stage use. Very natural and organic tone, that lets every tonal detail of your precious instrument come through. Touch sensitivity that follows every little nuance of your playing. With good care this handwired amplifer will give you decades of trouble free operation. As the name applies this amplifier is designed for classic guitar tones from 50’s to modern times. Classic tones from clean to distorted are easy to get and adjusted with your guitars volume and tone knobs. This is a cathode bias Class A amplifier and it do not need biasin, when changing tubes. Use only high quality 12AX7/ECC83 and 6V6 tubes. You are able to get legendary tones from both side the Atlantic that suit country, pop, rock, reggae, soul, hard rock, alternative and every other style-name the clever marketing people at record companies come out with. The amp has build in Reverb and Tremolo for the final old school touch. Old School 51 RT Combo 1x12"
Old School 51 RT Combo 2x12"
Preamp distortion and/or Power-amp distortion, with or without compression at any volume level. Three (3) gain structure options (Normal, Abnormal/Tube and Abnormal/FET). Four (4) different ways to adjust the ever critical treble response. Foot-switches for FET and adjustable Boost. Dynamics you have never experienced. Totally hand made, point to point wired 40-75W tube amp that is fine-tuned for the best possible tone. Based on the 20 years experience working with finest tubes amps. The circuit is as original as a tube amp can be, respecting the heritage of the greatest amps designs. The fine-tuned circuit with build in bias adjustment accepts 6L6, EL34, KT77, KT66, KT88, 6550 … even 6V6 if you can find ones that can handle 500V of plate voltage. The overbuild custom made transformers have enough juice to drive the KT88’s/6550’s to about 75W of power. With special POWERSUCK switch you can drive the power-amp to fat compressed tone at bedroom levels. PRESENCE controls another Treble frequency. You will find the optimal Treble response with any guitar and cabinet using these controls. You can get distortion from each input (NORMAL, ABNORMAL at tube setting and ABNORMAL at FET setting). You can footswitch between the TUBE and FET setting when you are plugged into ABNORMAL input and the TUBE/FET switch is turned to FET position. You can have distortion from Preamp or from Power-amp, you can have it at lower volume levels with the special POWERSUCK switch. There are lot of different distorted tones from this amp: “clean”, sweet, crunchy, fat, “On the edge”, singing, dynamic, with powertube saturation or without.. You can tailor the distortion so that treble distorts earlier than the low-end etc…. There are bias test points behind the back panel and you set the bias for the different tubes by using just a normal Volt meter. A Bias switch to switch between Hi and Low bias for EL34 or other types of tubes. Wide range bias trimmer to set the bias for different tubes. It takes only few minutes to change the power tubes and you can do it yourself. All parts are deliberately overrated to ensure reliable and safe operation. Circuit is to be as far as possible original or at least nonstandard. Construction should be neat and build to last. It should be the best amp ever built. It must be an inspiring amp to play!!! Two channel 101 watt (that is one more!) all tube amplifier. The layout is straight forward: one input, two gains and two master volumes and both channels share the same tuned tone controls. MP101 is designed for very easy set up, the classic tone stack with Bass, Middle, Treble and Presence knobs let you easily dial the tones you want, from country to metal. First channel is very dynamic with a lot of headroom and detail. There is a nice British Class-A type compression build into the preamp of the first channel, so you don’t need to crank the power-amp up to get that tone. Even with the compression you get very fast clean tone or great dynamic crunch into touch responsive old school distortion. The second channel will take off from there and you are able to get more gain and more compression and a tone that is voiced to suit heavier distortion with great note separation and detail. You can also dial another different clean tone from this channel if you prefer. The two channels are carefully balanced to give you the best cleans and distorted tones that are matched together. You just need to adjust one set of tone controls and the channels are in harmony. The MP101 was designed for great tones on all volume levels. This amp is as much home in small clubs or huge arenas and you will never run out of the power or tone. 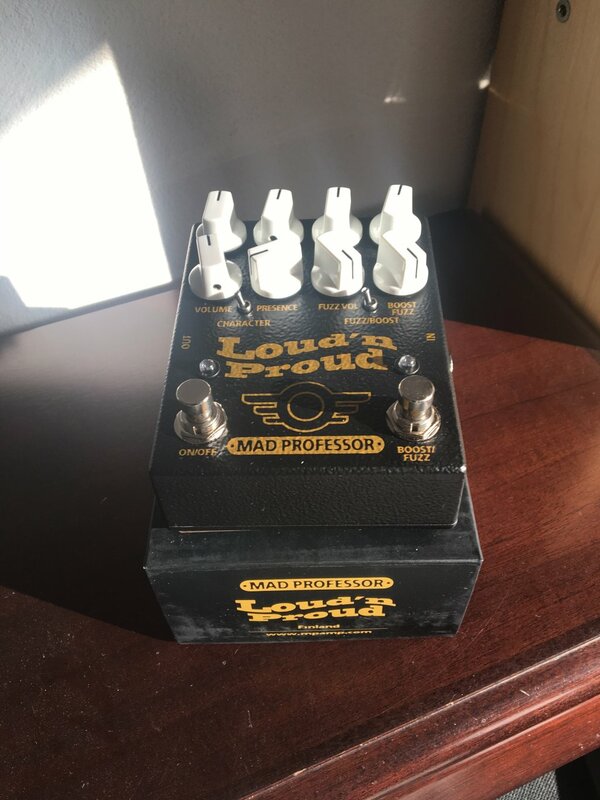 Like with all Mad Professor products we spend a lot of time adjusting the high-end response. Even heavy distortion is not piecing or shrill but still with great detail and clarity. The low-end stays always tight and solid giving foundation to your tone, be it super clean or heavy. Easy to setup and easy to play, the new Mad Professor MP101 amp is simple yet versatile amplifier with lot of power reserve. Classis looks with modern high-end tube circuitry to serve the art of guitar playing. Power amp tubes: 4 x EL34 (or 4 x 6L6, 4 x KT66, 4 x KT77, 4 x KT88, 4 x 6550) Amp must be biased after change tubes /tube type. Mad Professor 412 Cabinet gives you the best features of closed and open-back cabinet at the same time. Thanks to a very carefully designed structure the sound is a combination of tight bass of closed cabinet and airiness of open back cabinet. DRIVE: settings from low to center will allow you to control the saturation with the volume control on the guitar. SENSITIVITY: Sets the filter trigger level, tune this carefully to fit you /bass output and your playing touch. You can further change the sensitivity from your guitar volume knob while playing. PLAYING: Please take time to get used to the controls and as this is a voltage control filter it will react to your playing touch. The envelope control circuit is carefully designed to follow the dynamics of bass and it might take some time to master the Auto Wah playing technics. Try also adjusting guitar volume between 8 and 10 to further expand use. DRIVE: sets the amount of distortion and sustain, as well as the type of distortion. Lower settings give dynamically controlled overdrive, the unit distorts more the harder you strike the strings and there is no definite clipping point, but rather different shades of distortion as the amplitude changes. A good starting point with most basses is fully CCW, turn the knob until you find the overdrive level that suits your playing. Lower settings are good for old school tube amplifier tone, while higher settings gives denser distortion. NATURE: is a tonecontrol for filtering and to control what register distorts. Turning CCW gives more lowend and also distortion in the lower registers. Turning CW gives an emphasis in the upper midrange for more protruding solo bass tone. DEPTH: this a control for setting modulation depth. Turn it up for a deeper effect. 6F22 9V battery or DC eliminator 2.1 mm plug center negative and positive sleeve. Evolution Orange Underdrive (EOU) offers a new way to approach your tone. Instead of overdriving your clean tone, now you can get cleaner tones from your favourite overdriven tone. That is what we call underdriving. Evolution Orange Underdrive works really well with vintage single channel amps that sound great when you push them to overdrive. When you turn down the volume from your guitar to clean that tone, the sound often gets bit too dark and the clean tones are not as good as the overdriven tone. With EOU you can tailor your cleaner tone with the four pots. The Evolution Orange Underdrive works by lowering the midrange as that is where the overdrive mostly is. You can dampen the amplifier input with the EOU’s Volume control and then set the Bass and Treble to tailor your clean tone. COMPR. : Sets the amount of compression and sustain. lower settings give mostly peak limiting, higher settings more compression and less touch sensitive response. at maximum the output will be heavily compressed, while still retaining clarity at almost infinite sustain. A good starting point for this control is a bit below centre (ten o’clock) with most guitars. adjust CCW for full range compression and set at noon for tighter sound with a little less bottom end and turn fully CW to slightly reduce upper treble. TREBLE: a boost/cut “shelving” type equalizer that controls the amount of high end, operating where the Presence control is on most amplifiers. Treble can be used to add shimmer to even bright amplifiers without interfering with typical treble boost of most amplifiers. BASS: a boost/cut shelving type equalizer that controls the low end, just above resonance of a standard 4×12 cabinet. With both Bass and Treble turned up, you can get a scooped heavy tone, turn the knobs down for soft mid-boost tone. For Midboost: set Treble and Bass fully ccw. MASTER: this is a volume control that is located directly after the booster circuit and when set to max it is just a resistor to ground. This control sets the final output and it can be used to control the output when the pedal is used for overdrive (Boost turned up). TREBLE: set treble boost from zero to about 15dB. The treble frequency and bandwidth are carefully tuned with an optimized bass slope. BOOST: the gain of the booster and can be set from unity to about 40dB of boost. When this control is cranked the unit will distort within itself. BUFFER: inside the pedal there is a switch for a high quality buffer. You can set the pedal for true bypass mode or “buffer on” in bypass mode. We recommend using a buffer in your signal chain to help with the treble and gain loss from using many pedals and/or long cables. Pedals are shipped “buffer on”.The Mad Professor RRB Buffer is an amplifier with a voltage gain of exactly 1x (times). The RRB buffer output impedance is set a little lower than the Dc resistance of a standard guitar pickup to equalize the effect of following load impedance. Input impedance is set at 500K for a medium load to standard guitar pickups. This keeps the tone and guitar volume taper natural. TREBLE BOOST: Set Boost to minimum and Master to maximum and adjust for desired treble boost with the Treble knob. STRAIGHT BOOST:Set Treble to minimum and Master to maximum and adjust Boost to desired effect. DISTORTION: Set Boost to maximum and adjust output level with Master to unity, then adjust Boost for desired depth and overdrive. Treble can be used to enhance distortion effect. VOLUME sets the output level of the distorted signal. TONE:: This is a boost/cut “shelving” type equalizer that controls the amount of high end, operating somewhere between a bright switch and the treble control on most amplifiers. – higher with heavier distortion. removed or damage will most likely occur. Complete bypass (true bypass) and input of circuit grounded when in bypass. 6F22 9V battery or DC eliminator 2.1 mm plug center/negative and positive/sleeve. The Stone Greay Distortion is protected against wrong DC eliminator polarity. Use recommended voltage for best results. RESONANCE: sets the resonance of the effect, making it sharper when increased. ROTATING SWITCH: switches between two different phaser effects, a deeper and a lighter one. is a distortion/reverb pedal designed to provide the sought after “Brown” guitar sound of the late 70’s early 80’s, when played through a clean amplifier. The Mad Professor sweet Honey overdrive deluxe (SHOD DLX) is a touch sensitive, medium gain overdrive pedal designed to overdrive distorted amplifiers and give dynamically controlled low to medium gain tones with clean amplifiers. Our unique focus control allows you to adjust the feel and dynamics of the pedal as well as the overall EQ. Distortion levels are controlled by pick attack. Pick harder for more overdrive and play softer for cleaner tone. the SHOD DLX provides more versatility than the classic sweet Honey overdrive due to the added functionality of the new controls. Both the SHOD and SHOD DLX are designed to work with all kinds of guitars and amplifiers. VOLUME: Sets the output volume. TREBLE: Post distortion, it cuts and/or boosts the treble. BASS: Pre distortion, it sets how the bass and low mids are distorted. FOCUS: Controls how easily the circuit distorts as well as adjusting overall eQ. Turning CCW gives less distortion and a mellower effect, turning CW gives a slight treble boost and earlier distortion. A good starting point is 11 o’clock.